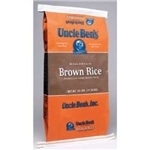 Uncle Ben's rice, first sold in 1943 and the country's top-selling rice between 1950 and the 1990s, is an American institution, and we're proud to be able to offer you the Uncle Ben's product in our lineup of whole grain rice. Whole grain is so much healthier than denuded white rice because the nutrients haven't been processed out. Foothill Farms Spanish Brown Rice, also a whole grain item, is a wonderfully tasteful rice full of intense flavor provided by the spices, bell peppers, tomatoes, onions and garlic. Whole grain fiber is suspected by doctors to reduce the risks of colon cancer and heart disease. Rice Teriyaki Whole Grain - 27 Oz. 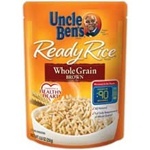 Our collection of Uncle Ben's rice includes Whole Grain Red Rice, Whole Grain Medley Rice, Brown Rice, Brown Rice with Quinoa and Seeds of Change Seven Whole Grains Rice, all healthy alternatives to processed white rice. These are economical filler foods to boost your restaurant profits.